The Durbanville course is set in a beautiful park landscape, softly undulating with picturesque mountains in the background. 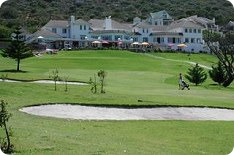 The very well maintained course is - compared to others in the Cape - quite protected from the wind and pleasant to play. The Halfway House near hole 9 offers snacks and refreshments. Visitors are very welcome. For further details, tel (021) 976 8120. The Erinvale Golf Course in Somerset West is a Gary Player designed course and is considered one of the best in the Western Cape. Situated at the foot of the Helderberg Mountains, the views are spectacular with the beautiful False Bay and the Hottentots Holland mountain range in the east. The mountains protect the course from the wind. A scenic hilly second 9 compliments a flat challenging first nine. For further details, tel (021) 847 1906. Located near Cape Town International Airport, King David's golf course is set amongst a meandering and rolling landscape. The golf course is fairly sheltered from Cape Town's trong winds and is renowned for staying dry and firm during wet winters. 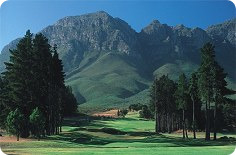 The course is well laid out with plenty of trees and offers spectacular views of Table Mountain and Devils Peak. For further details, tel (021) 934 3056. 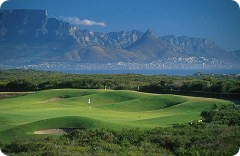 Located in the heart of the city, the main advantage of the Metropolitan golf course near Mouille Point is its position. It is within easy reach of Green Point, Sea Point and the V&A Waterfront and offers beautiful views of Table Mountain. Visitors are welcome. For further details, tel (021) 434 7808. Situated alongside the sea in Milnerton, this is a fairly exposed course with little to protect it from the strong winds that blow in summer - this makes for a challenging game. 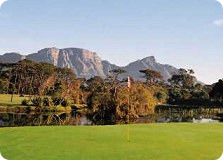 The course offers scenic views out to sea and towards Table Mountain, and the nearby lagoon boasts an array of waterbirds. For further details, tel (021) 552 1047. 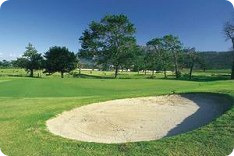 The lush green fairways of Mowbray golf course are lined with indigenous trees and tall pines. This championship course is within 10 minutes of the city centre and has been home to a number of prestigious competitions and offers sweeping views of Devils Peak and Table Mountain. The club house is new and modern after being being rebuilt following a fire in 1994. 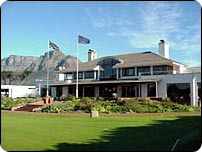 The Royal Cape Golf Club is the oldest in South Africa and has been home to numerous competitions. The course offers fantastic scenery and views and can be particularly windy making for a challenging round of golf. With a picturesque backdrop of vineyards and mountains, Steenberg Golf Estate is set amongst an exclusive residential development and hotel. 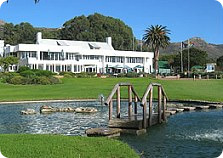 The 18 hole championship golf course meanders leisurely through the Steenberg vineyards, pine forests and gentle waterways and is reserved exclusively for the use of hotel guests, members and their guests. Set against the backdrop of the Silvermine mountains, Westlake Golf Cub is extremely popular and is an easy-to-walk course characterized by its towering trees.